So it leans, big deal. But they damn near charge you a Ferrari to go to the top. But I knew that there was much better stuff in Pisa to see than this tourist trap. Pisa was one of the most influential cities in the Italian Renaissance, and it deserves a deeper look than tourism cliches. We’ll peek beneath its surfaces here. 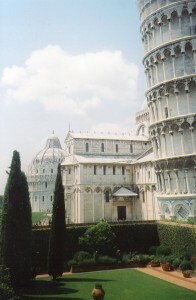 The Leaning Tower is part of the Campo dei Miracoli (Field of Miracles). Pisans had good reason to call it that. An inscription on the cathedral facade says that they had won 4 naval battles with the Islamic Saracens in Sicily and Sardegna between 1005 and 1034. Another inscription says that Pisa took booty from another victory over the Saracens in 1064. 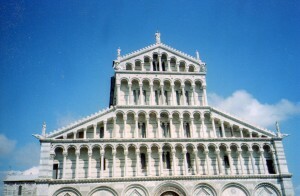 Pisa emerged as one of the great sea powers in Europe’s expanding economy. 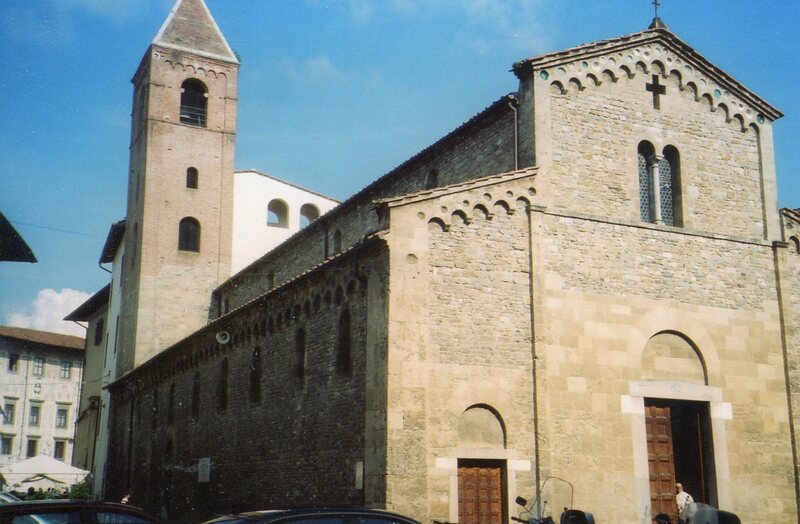 This handsome Romanesque church in Pisa’s center is from the 11th century. 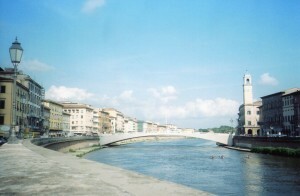 The main section of town is well worth exploring, but Pisa’s greatest glories are in the Field of Miracles. 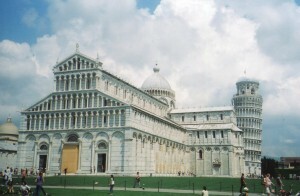 Pisa’s cathedral was begun in 1063, and enlarged in the early 12th. Its people were thankful for their 1064 naval victory, and for their growing wealth, and they spared no expense to glorify Jesus and the Virgin. And they beautified their house with handsome Romanesque columns and arches. 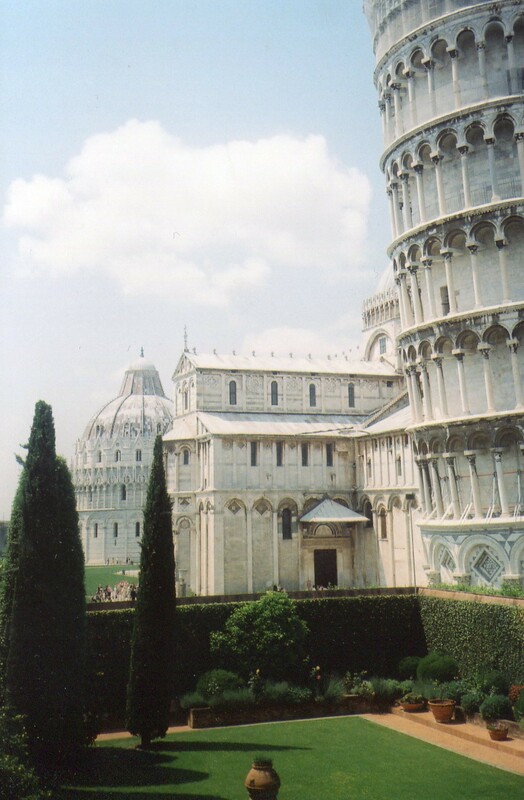 Westerners had seen lines and arches as models of divine truth and order since Antiquity, and ancient Rome was one of Pisa’s inspirations. The emerging commercial power looked back to Rome’s glory for her identity. Jerusalem’s Dome of the Rock was the other model, which was also designed in terms of lines and arches. 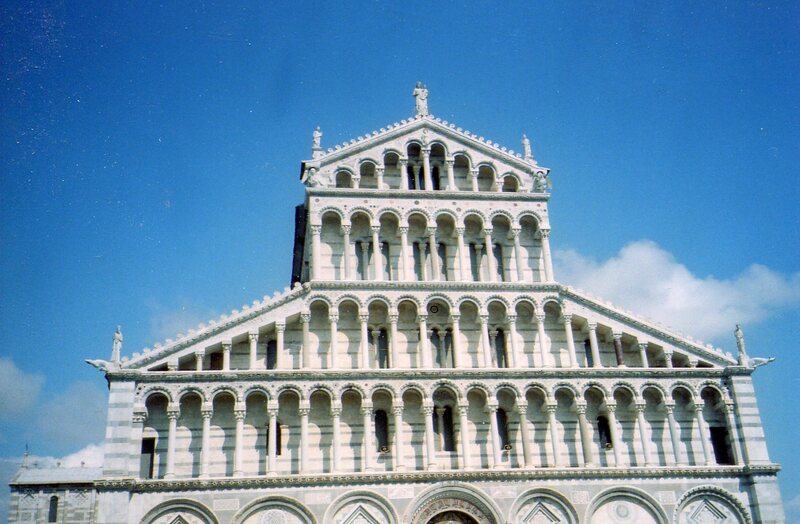 These static geometric forms on Pisa’s cathedral thus signified both earthly dominion and divine order. But as the above shot shows, Pisans made these stately forms thinner and more elegant. Florentines designed the Basilica of San Miniato with harmonic geometries. But Pisans built several levels of continuous rows of narrow arches that are so gossamer that the stone seems to dissolve into the heavens. The apex of the roof is crowned with a statue of the Virgin holding the Child. Geometry thus leads to the two who set Pisa on her path to wealth. Italian architects and artists continued to use static lines and arches to express enduring truth throughout the Middle Ages and Renaissance. But if you spend enough time at Pisa’s cathedral, you might conclude that nobody ever did it better. For a real cool comparison of cultures’ views of the world, check out Chinese architecture.